On May 20, 1959, in the final days of Hawai’i’s territorial era, three months before the Hawaiian Islands would become America’s 50th state, a baby was born in Honolulu’s historic Kuakini hospital whose voice would unite the Hawaiian people and be heard all over the world. He was the third child of Evangeline Keale Kamakawiwo’ole, a Hawaiian woman born on Ni’ihau, and Henry “Tiny” Kaleialoha Naniwa Kamakawiwo’ole, a part-Hawaiian born on O’ahu. His proud parents knew he would be special even before he emitted his first bold vocals. They named him Israel Ka’ano’i Kamakawiwo’ole. In Hawaiian his last name translates “the fearless eye, the bold face.” Tiny and Evangeline would spoil Israel far more than his brother and sisters; he could do no wrong. This native son was a rare breed, an almost pure Hawaiian of unusual lineage; he could trace his ancestral roots to an island that even today remains the most Hawaiian of all, the so-called “forbidden” island of Ni’ihau. Israel, now in his early teens, resisted a move to the country. Israel had no idea, nor could he have ever known, how the move to O’ahu’s Wai’anae Coast would cause fundamental change in his life. In Makaha, he would form a band that would rock the islands. The chance encounter of two truant schoolboys (Israel and John Koko) at the beach was the beginning of a band everyone would soon know as the Makaha Sons of Ni’ihau. The Makaha Sons went on to record 21 albums, win many Na Hoku Hanohano Awards and change Hawaiian music history. In 1993, following a successful run as one of the members of the Makaha Sons of Ni‘ihau, IZ decided to venture out on his own. He reached out to me because of my success as a producer of contemporary Hawaiian music giants like the Brothers Cazimero, Brother Noland, Rap Reiplinger and many more. Our meeting would set the stage for the rest of Israel’s career. IZ made it known that he wanted a solo career and wanted my help to chart this new course in the music industry. IZ felt that my track record as a producer and the strength of the Mountain Apple Company organization perfectly suited his needs. Our relationship blossomed and for the rest of his life, I was IZ’s producer, confidant and musical mentor. Our first release was his remarkable solo CD Facing Future. The production focused on Israel’s stunning voice and launched his incredibly successful solo recording career. Facing Future was followed with the release of another five remarkable recordings, E Ala E (1995), N Dis Life (1996), IZ In Concert: The Man and His Music (1998), Alone In IZ World (2001) and Wonderful World (2007). 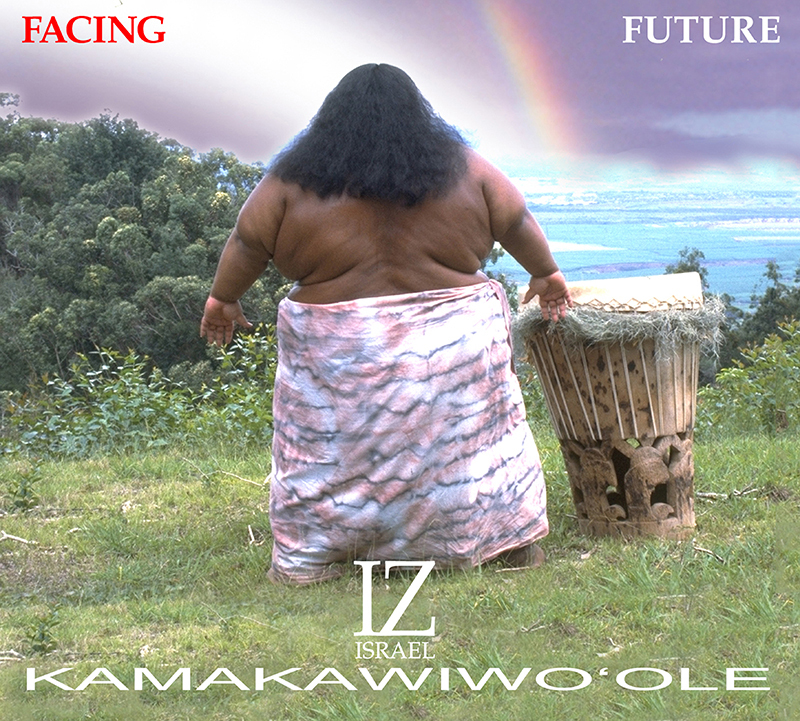 Facing Future remains the top selling Hawaiian music album in the world. In 2002 it was certified gold by the RIAA, a first for a Hawaiian record label. In 2005, it was certified platinum for sales of over 1 million units. Then Alone In IZ World was certified gold. 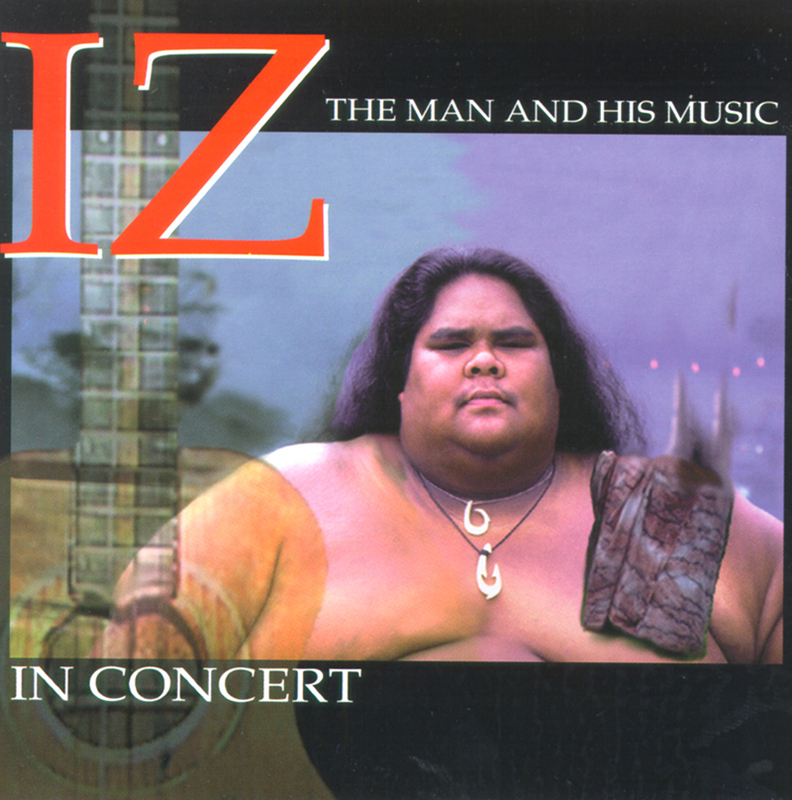 With each passing year, IZ’s presence in the music industry and the sales of his recordings continue to grow despite the trends that surround the industry. An amazing story about an amazing man, the man referred to by some as the “Hawaiian Suppaman”. 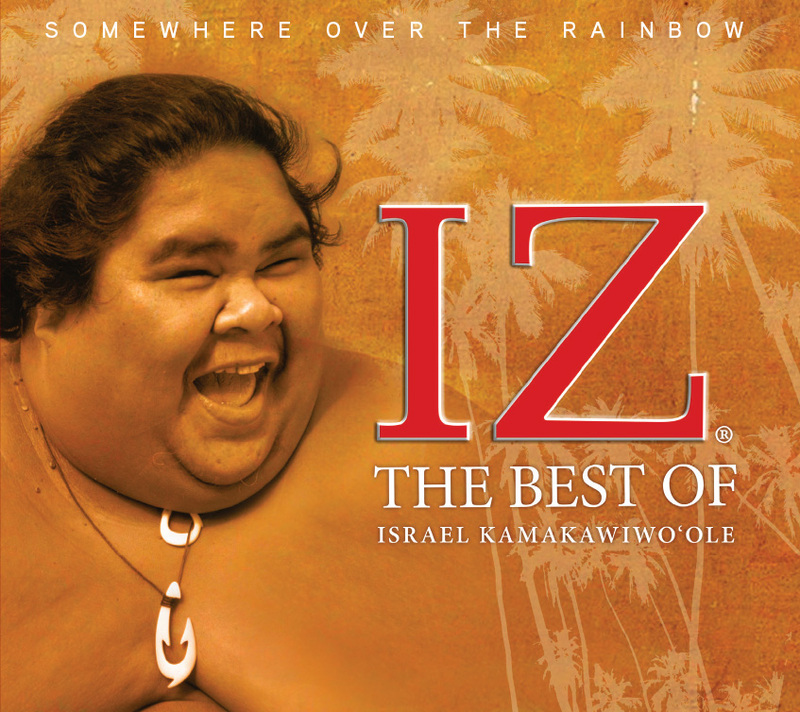 While IZ has always been revered in Hawai‘i, his worldwide influence came later. 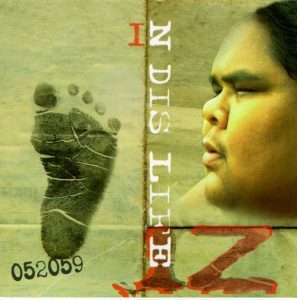 IZ’s music first gained national attention in the mid 1990’s. Billboard Magazine writer Doug Reece writes: “In 1997 there were only seven weeks when Hawaiian musicians–citizens of a state whose population is a fraction of all others–did not appear on the Top World Music Albums chart. Even more impressive was the individual tally scored by cherished, recently deceased vocalist Israel Kamakawiwo`ole. His (most recent) album N Dis Life ran a remarkable 39 weeks on that chart…” Listeners around the world were becoming aware of the power of the music, including those involved in film and television. These great fans were insistent in their desire that IZ’s music be used in their projects. The more IZ was exposed to the world, the more fans responded. 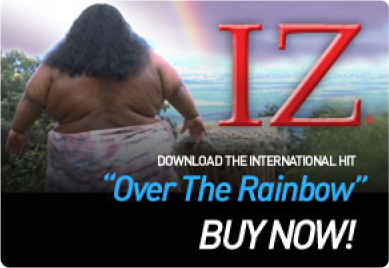 Universal Films contacted The Mountain Apple Company about an exclusive license to use IZ’s recording, “Over The Rainbow/What A Wonderful World” in the movie “Meet Joe Black”. The call was the result of director Martin Brest’s (“Scent Of a Woman”, “Beverly Hills Cop”), love of this remarkable version. Next, eToys.com adopted IZ’s music for a series of national television commercials. Israel’s sweet voice was matched perfectly to these television commercials, which celebrate the innocence and beauty of childhood and the discovery of a world filled with wonder. This success prompted feature articles in the Washington Post and TV Guide. More exposure led to more fans, and the fans were truly passionate in their support. In December 2000, best-selling author Dean Koontz honored Israel in the front of his new book “From The Corner of His Eye”. 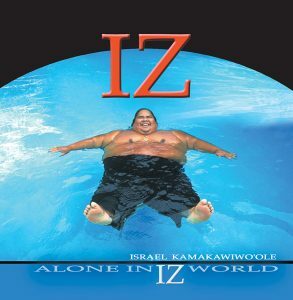 Koontz’s quote pays tribute to the power of this music: “As I wrote this book, the singular and beautiful music of the late Israel Kamakawiwo‘ole was always playing. I hope that the reader finds pleasure in my story equal to the joy and consolation that I found in the voice, the spirit, and the heart of Israel Kamakawiwo‘ole.” Koontz followed this tribute by yet another kudo to IZ in another best-selling book “One Door Away From Heaven” released in December 2001 by saying: “For the second time (the first having been as I worked on “From the Corner of His Eye”), I have written a novel while listening to the singular and beautiful music of the late Israel Kamakawiwo‘ole. When I mentioned Bruddah Iz in that previous book a couple thousand of you wrote to share your enthusiasm for his life-affirming music. Of his six CDs, my personal favorites areFacing Future,In Dis Life, and E Ala E.” Once a presence as large as IZ gets moving, it’s very tough to stop, and it didn’t. The momentum continued into late 2000, as once again his music was featured in a major motion picture, “Finding Forrester” starring Sean Connery and directed by Gus Van Sant (“Good Will Hunting”). The only vocal track included on the film’s soundtrack with Miles Davis, Ornette Coleman and Bill Frisell, it exposed IZ to jazz fans world-wide, and respond they did. In July 2001, IZ’s music hit the big screen once again, this time in the movie “Made” starring Vince Vaughan and Jon Favreau. On January 29, 2001, America On Line (AOL) included information on IZ on their welcome screen, unheard of for a Hawaiian musician. 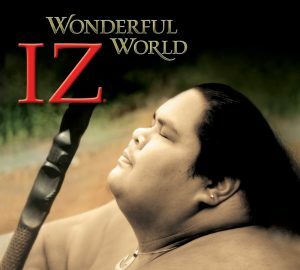 Millions of AOL subscribers were introduced to IZ and his music as they logged on-line. 2001 also saw the release of IZ’s CD Alone In IZ World, which debuted #1 on Billboard’s World Chart and #135 on Billboard’s Top 200. This CD is one of only 12 to ever debut at #1 on the World Chart. It has remained consistently in the Top 10 of Billboard’s World Chart until it was required to move to the world catalog charts where it has remained a fixture ever since its release. Indeed, Facing Future has remained on the World Chart for an astonishing 493 weeks, with Alone In IZ World staying there for 300 weeks (all in the top 5), each with no hint of faltering. To this day, IZ’s music is still on Billboard’s charts. Facing Future is bearing down on 700 weeks in the top 10 of the World Chart, Alone In IZ World has been on the chart for 423 weeks and Wonderful World enjoys 150 weeks on the chart (at the end of 2009). The release of Alone In IZ World garnered articles in the prestigious Washington Post and Chicago Tribune and again, more fans followed. In May 2002, producer John Wells selected IZ’s music for the top-rated television show “ER”. Wells placed it in the season finale that was viewed by 50 million people. Following the exposure of his music in “ER,” IZ was featured in People Magazine and Parade Magazine. Again, more exposure brought more loyal and passionate fans. The result was even further exposure when the music was used in the hit film “50 First Dates” starring Adam Sandler and Drew Barrymore. The music served to highlight the final emotional scene, drawing raves from viewers. Immediately following the release of the film, “Over the Rainbow” hit the R&R (Radio & Records) Adult Contemporary Chart as well as the Billboard AC Single Chart, climbing steadily as AC radio stations across the country started adding the song to their playlists. The ability of Israel’s vocal to make an immediate connection with the listener has made him a favorite of major advertising agencies. His recordings are featured in commercials throughout the world, which remain in rotation because of Israel’s unique ability to connect. For reasons that cannot be adequately explained or understood, people feel good when they hear his voice, they feel safe and they feel happy. It doesn’t matter who you are or where you are from. It doesn’t matter whether you are a truck driver or a movie star. 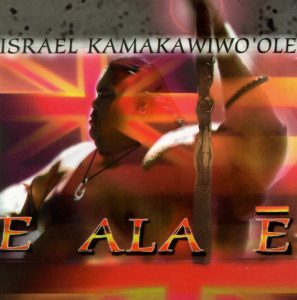 That indefinable unique characteristic which is at the core of all great music burns bright in Israel Kamakawiwo’ole’s voice. It is for that reason that Hawaiians worldwide consider him their standard bearer. It is why his fans include Bette Midler, Adam Sandler, Jim Carey, Sarah Jessica Parker, Sean Connery, Drew Barrymore, Dean Koontz, Paul Simon, Jimmy Buffett, Jon Favreau, New York Mets’ Benny Agbayani, director Martin Brest, producers John Wells and Zalman King, Japan sumotori Konishiki, Akebono and Musashimaru, and people of good will throughout a world sorely in need of it. What a Wonderful World, indeed it IZ. A mechanical license is the license that permits you to make compact discs or other mechanical reproductions which contain your cover version of someone else’s song on it without infringing on the composer’s copyright. If the cover version you are making is a non-dramatic musical work then Mountain Apple Company will issue you a mechanical license at the rate established by the Copyright Tribunal provided you deliver your request for a mechanical license within 30 days of the release of your album or single to the public. Otherwise, Mountain Apple Company may, but is not required, to issue you a mechanical license. If the cover version you are making is for a dramatic use, such as a film soundtrack or for use in a musical play, then a different type of license must be agreed to by Mountain Apple Company and you before you can release your album or single to the public. If you are interested in a mechanical license, request a license by clicking the button below. A synchronization license, is the license that you need to use someone else’s song and/or recording in your television show, commercial, music video or movie. The term synchronization comes from the fact that the process involves synchronizing the recorded music to the visual image. All of the terms of a synch license must be agreed to before you can use a Mountain Apple Company song or recording. If you are interested in a synchronization license, request a license by clicking the button below.